Ray Lewis told his teammates during a team meeting on Jan. 2 that “this will be my last ride,” and he’s retiring following the end of the Ravens’ playoff run—which began Sunday with a win against the Indianapolis Colts—closing one of the greatest careers in NFL history. Following this announcement by the Ravens veteran middle linebacker, the media unleashed a torrent of articles chronicling Lewis’ legendary 17-year professional career and his larger-than-life legacy. Both fans and pundits alike debated where the 37-year-old, future Hall-of-Famer ranks amongst the greatest linebackers of all time, and whether he is the greatest defensive player ever to play the game. On the heels of Lewis’ revelation also came speculation as to whether this past Sunday marked the last time Ravens Pro Bowl safety Ed Reed will ever run out of the tunnel at M&T Bank Stadium again. Reed, 34, who is currently in his 11th season with the Ravens and has tried unsuccessfully to secure a deal with the team for the past two seasons, may join Lewis in not returning to Baltimore when he becomes an unrestricted free agent at the end of this season. Ray Lewis and Ed Reed have always been inextricably linked throughout their storied football careers. So it’s unsurprising that whenever one is mentioned, so is the other. They have followed similar paths to greatness. They both flourished at the University of Miami, where they became All-Americans. They both were late first-round draft picks selected by the Baltimore Ravens, overlooked because they were said to be too small. They both have amassed gaudy stats and plenty of accolades during their NFL careers, as they have dominated the field of play from their respective positions. They both have been the centerpieces of the Ravens’ vaunted defense that has terrorized offenses around the NFL for more than a decade, standing together as the organization’s franchise players and two of league’s most respected stars. When the curtain drops, they both will be sure-fire first ballot Hall-of-Famers. One common element that lies at the core of their success—and it’s one that you won’t read too much about—is the bond they both share with Monte Sanders, or “Mont”, as he is sometimes affectionately known. Sanders is the CEO and owner of Sanders Optimum Fitness, but he has been much more than just a fitness expert and the celebrity trainer of this legendary duo. He is a workout partner, a close personal friend, a big brother, a confidant, and a trusted advisor. He is one of the secret ingredients behind their ability to play at such a high level for so long—in a league that’s moniker is “Not For Long”—as well as a transformative influence in their lives. "The day I met Monte,” says the 13-time Pro Bowler and 7-time First-Team All Pro, Ray Lewis, “my life changed not for training perspective, but for a man. When I bumped into a man like that, the training part was easy [be]cause we had the same mindset." Sanders had been working as manager at a bank when he was laid off and his career came to a screeching halt after he had spent years working his way up the corporate ladder. “And one day, I just cried out to God and I was like, ‘Take over my life. I’m done with Monte. Just use me as you will,’” as Sanders recalled, in an extensive interview with Access Athletes, that he decided to rest it all on faith. In this time of uncertainty and upheaval, one thing remained constant in Sanders’ life—his love for working out. Sanders turned to the passion he had developed as a young teenager growing up in Savannah, Georgia for solace. One day when he was working out, one of Sanders’ friends told him he should go get certified. Sanders jumped at the idea, realizing that he could use it to make some money on the side until he figured out what God had in store for him. With his ACE personal training certification in hand, Sanders started training people at World’s Gym in Largo, Maryland. His clients were getting great results, but he grew tired of a system where he was only receiving a small portion of the $70 per hour the gym billed for his services. So he started training people on his own outside of the gym. Word spread quickly about his private interval workouts and he was in high demand. Now all those years of carrying his gym bag to the bank and running 5 miles before work came full circle and Sanders was about to catch his biggest break yet. 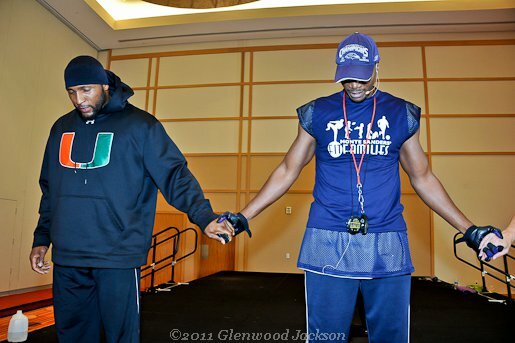 His entre into working with two of the NFL’s most elite athletes came by way of Eric Green, a close childhood friend. The two-time Pro Bowl tight end who played 10 seasons in the NFL introduced Sanders to Ray Lewis in 1998. But it wasn’t until 3 years later, when Lewis was fresh off being named Super Bowl XXXV MVP, that the two would rub shoulders again. In early 2001, Green went to meet up with Ray Lewis and invited Sanders to join them. They both had remembered each other. When Lewis asked Sanders what he was doing the following day, and Sanders told him he was working out, Lewis invited himself to come along. So they met the next day and worked out together. Lewis was so impressed by Sanders’ training regimen and his mind, body, soul philosophy that they instantly became regular training partners. Working out became a cathartic outlet where they would discuss the daily struggles of being young men and seize the opportunity to reflect on and learn from each other’s mistakes. Nothing was too personal. Lewis was so transfixed by Sanders’ training and his transformation that he decided to bring his protégé Ed Reed into the fold in 2003. In the off-season after his rookie season, Reed had asked Lewis to share everything with him because he wanted to be one of the greatest. He wanted to learn about Lewis’ work ethic. So they brought him in not only to work out, but they also introduced him to everything that they had been doing for years, including their marathon film study sessions and discussions about the x’s and o’s of football. Ed Reed was now hooked. The brotherhood was born, and the three of them became inseparable, working out full-time together for at least 2.5 years straight during that period. “So we all practically lived together and just worked together every single day,” Sanders reminisced. A desire to do your best. A desire to be great. A fear of failing. Together, Sanders believes, these three attributes breed a great work ethic, and are the reason that Lewis and Reed have ascended to the top of their sport. Starting with a monstrous work ethic, these two are defined by their fierce competiveness, relentless passion, and untiring drive. Sanders is from the same ilk. These are the same seeds that his mom and dad planted in him as a child: “Never settle for mediocrity. Don’t blend in; blend out. You need to be great at what you do. Don’t be satisfied with just being good.” He attended a strict military high school, where work ethic and discipline were beat into his makeup. At each stage in his life, Sanders relied on desire to be great to rise to the top. In high school, he was the captain of the football and basketball teams, and he obtained the rank of company commander in his ROTC program. In the corporate world, he started off answering telephone calls, but eventually he worked his way into the management training program. Training would be no different for Sanders. He initially told Lewis and Reed that he is an extreme, “all-in or all-out” type of person. He embodied passion, drive, and dedication. They were the same way too, so naturally things just clicked from there. “So when you share the same work ethic with someone and the same passion to get better, that really makes the bond stronger,” says Sanders. “It makes the team stronger. When Lewis announced his retirement, he reflected this sentiment to reporters, as he put the team first. “I never played the game for individual stats. I only played the game to make my team a better team,” he said, as the only player in NFL history to register more than 40 career sacks and 30 interceptions, among other notable records. This coming from a guy who, thanks in part to the assistance of his training regimen, Lewis and Reed became back-to-back AP NFL Defensive Players of the Year in 2003 and 2004, respectively. While Sanders had always been in shape, there was something that wasn’t right on the inside. “If you’re working out and you’re not learning from those mistakes, you may be a little stronger, but at the end of the day, you’ll still be empty.” Sanders had that feeling of emptiness. “You know we are three-part beings: the mind, the body, and the soul,” said Sanders. “But most people think when they’re working out, they just focus on the body.” Sanders had fallen into this common trap. If you work on your body for 30-45 minutes a day, he says you have to spend time with your mind and your spirit as well.” To illustrate the importance of a balanced approach, he starts rattling off analogies from the book he’s been working on called Train Smart: Physically, Mentally, Spiritually. Things You Need to Know Prior to Working Out. “It’s like say I’m walking up to your car, and you have this nice car that shines and it’s detailed on the outside, and then I go inside, and you got cigarette butts in the ashtray.” It doesn’t match. So he began to do some self-evaluation and deep reflection. And through his extensive training, he learned to tap into the inner-part of his being. With his renewed sense of self, he started to share his experiences and pass them on to Ray Lewis (and eventually to Ed Reed). Naturally, it’s easy to see how Sanders’ philosophy and principles would appeal to world-class athletes who always seem to be chasing the elusive, balanced lifestyle in the face of a never-ending supply of temptation that comes with being in the limelight. Preparation for the workout begins many hours prior to the actual session, with meditation and visualization to rehearse the workout in the mind. It’s the same way an athlete gets ready for a game. Once the workout begins, they may utter, at the most, 10 words to each other. They need to conserve every ounce of energy in order to complete the demanding routines. “We may be working out and [if] you’re talking about what’s going on tonight, or a phone call you just had, or a text, you won’t make it through.” You have to be totally locked in to survive these punishing routines. The workouts are absolutely grueling, and range from functional training to sports-specific training. To remain in optimum shape, the workouts are based on a training principle known as muscle confusion, which states that you must constantly vary exercises, sets, reps, and weights to avoid the muscles adapting to the same stress being continually applied to the muscles over time, leading to a plateau in growth. The off-season regimen has included two-a-days, six days per week. A series of workouts in the off-season might look something like this: After they’ve had time to digest their breakfast meal, they warm up with about 300 ab variations. Then, they go off on a 6-mile interval in the sand, which includes exercises such as jogging, walking, back-pedaling, shuffling, karaoke. They leave to have a little snack, and then they have lunch. After lunch, there is a weightlifting session, and then they have another little break. Then they come back and do abs again, followed by another 6-mile interval. The next day, they would switch it up, and maybe do agility ladders in the morning and the Ravens team fitness test (as only one of their workouts that they do before and after other exercises). Lewis has also participated in a variety of activities in his off-season routines such as wrestling, MMA training, martial arts, kickboxing, or swimming in the ocean. The last couple of off-seasons, Lewis took up cycling, and would bike 20-25 miles per day—he shed about 20 pounds coming into this season. During the season, they have met more sporadically, depending on where Lewis and Reed are in the season, and if they need to gain or lose weight, or rehabilitate an injury. This season, Lewis missed 10 games with a torn right triceps and he has called rehabbing the injury the “craziest 12 weeks of just training” that he has ever put himself through. They eat regular meals 5-6 times a day, and their diets consist mostly of natural and organic foods—a lot of fish, as well as fresh fruits and vegetables. Sometimes they may supplement meals with natural protein, or they may drink pre-workout shakes for a little boost of energy. Lewis has a personalized nutrition plan based on DNA-based genetic tests. With a blueprint of Sanders’ principles and his roadmap to success firmly embedded in their minds from years of training together, now it’s to the point where they don’t have to be together every day and they don’t have to train together every off-season. Sometimes, they communicate over the phone to make adjustments to their workouts. At first, when it all began, working out was the common denominator. Then, it became way more than just working out together. Sanders is the godfather to one of Lewis’ sons, and he’s spent time with Reed’s family. For years, Sanders has impressed upon Lewis and Reed that football is just a game. He has helped them to put their professional football careers into proper perspective. This, he says, is the true balance of it all. Now football is fun to them. Sure, their competitive nature still makes it so they want to win every game and the Super Bowl every year, but it’s fun too. It’s no longer a black or white proposition. Other priorities have come into the picture. Sanders’ dedication to fitness has afforded him the opportunity to train not only Ray Lewis and Ed Reed, but also a host of other celebrities clients: Baltimore Ravens Owner, Steve Bisciotti; R&B Artist, Mario; and Actress, Drew Sidora, to name a few. But his true passion is helping everyday people battle everyday struggles. Through his company Sanders Optimum Fitness, he has made an incredible impact in the Baltimore community, and around the country. “I was really interested in touching other peo ple’s lives,” says Sanders, who wakes up every morning at 3:50 a.m. to meditate and protect his mind and spirit before he trains hundreds of people, of all ages, in his weekly fitness classes. While Sanders had been training Lewis, he started thinking to himself, “How can I help other people besides professional athletes?” So he started offering online training and nutrition programs and holding classes and camps where he could invite people to experience his results-oriented NFL-style workouts, but at their own individual fitness levels and at affordable rates. His fitness programs incorporate the total body and are designed to create an optimal level of cardiovascular endurance, muscular strength, and flexibility. 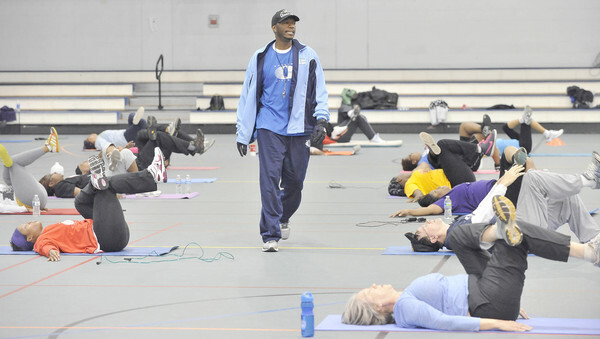 In 2009, he launched the Monte Sanders’ Fit Families, a non-profit organization that focuses on childhood obesity and the importance of family fitness by providing ongoing fitness camps for students at several Baltimore City Public Schools. 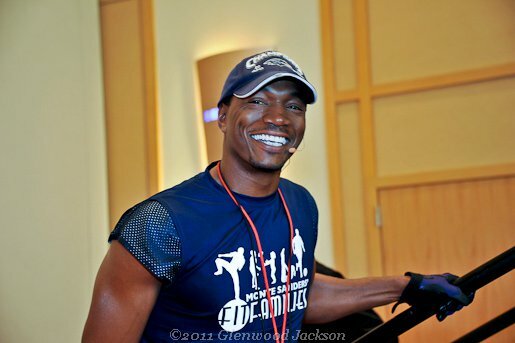 In addition to his 4-week fitness transformation classes and personalized online plans, Sanders regularly provides corporate wellness programs/seminars to the Baltimore Ravens front office, and has provided such programs to the Baltimore City Police Department and Black Entertainment Television. He also created Optimum Total Body Workout, a 30-minute DVD that features a results-oriented total body workout for all ages and fitness levels. Because he has dedicated his life to helping others lead healthy and productive lives, he was appointed by the Governor of Maryland to the Maryland Advisory Council on Physical Fitness, he serves as a Heart Health Spokesperson for the American Heart Association, he and his team led the warm up for a crowd of thousands for President Obama’s Whistle Stop Train Tour through Maryland in 2009, and he was a featured Fitness Expert on “Big Kids”, a childhood obesity television special on the Discovery Health Channel. Despite his incredibly hectic schedule, you can be assured that Sanders will be watching the Ravens attempt to make a run deep into the playoffs—most likely by himself—but no matter what the outcome ends up being, even if it may be the end of an era in Baltimore, he knows that both Ray Lewis and Ed Reed will be just fine when it comes time for them to create a new legacy. To learn more about Monte Sanders and Optimum Fitness, visit www.SandersOptimumFitness.com. Follow Monte on Twitter or send him a question or comment. Matthew Allinson is the Founder & CEO of Access Athletes. Follow him on Twitter. Send Matt a question or comment. Access Athletes will be attending Anquan Boldin's Inaugural Fundraiser Dinner for the Anquan Boldin Foundation (Q81 Foundation) tomorrow evening at M&T Bank Stadium. Bridgett Coates of Exposure BBC invited me to cover the event and I'm thrilled for the opportunity to be able to provide my readers with a glimpse into Boldin's charitable work. 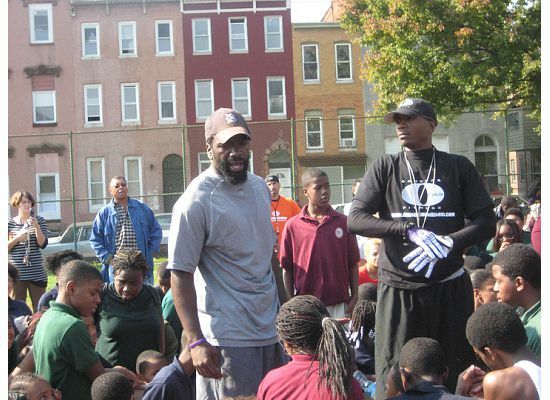 Boldin, who was awarded the 2010 Ravens’ Walter Payton Man of the Year award, has a strong record of community service with the many successful youth programs he has established. Other athletes can learn a great deal from Boldin's perspective on philanthropy and what it means to him to be a professional athlete, as reflected by his quote below. "I don't want to be just another guy who played in the NFL. We have a bigger purpose to touch lives and I'm trying to do that." I look forward to writing more about the Q81 Foundation event in the near future. When it comes to protecting our environment, it’s easy for some people to turn their backs and simply caste this responsibility aside as someone else’s issue. To them, it’s just an afterthought. To Atlanta Falcons fullback Ovie Mughelli, this cavalier mentality is at odds with his most fundamental beliefs regarding the environment. Mughelli, a staunch environmental activist, points out that those who espouse this mentality will never win a game in their life. Unfortunately, he laments, this is the mentality that we’ve adopted as human beings to save our planet. Mughelli isn’t the type of a person who is going to sit around idly and wait for others to step up. He’s not only doing his part, but he has been imparting on others the importance of them doing their part too. Through the Ovie Mughelli Foundation (OMF), Mughelli has put a masterful game plan in place to make his mark on the environment and in the community. Once again, the sports headlines of the past week have been filled with high profile athletes finding themselves embroiled in controversy. New York Jets' wide receiver, Braylon Edwards, was arrested earlier this week for driving while intoxicated. Following a semi-tumultuous exit from his former team, the Cleveland Browns, Edwards reportedly got into a physical altercation with a member of former Cleveland Cavalier LeBron James' entourage.